All of the metal hardware corrosion will clean right up with a capilary oil soaking, 3M pad teasing and occasionally a dremel wire wheel. These tuners are standard 6 IL tuner spacing; But I'm not sure I would even change out such a history if the tuners work well, and there isn't any reason for them not to once their boss fittings are checked, aligned and tightened, their clutch screws adjusted, and the gears and bosses are lubed with a drop of Tri-Flow at each action point. 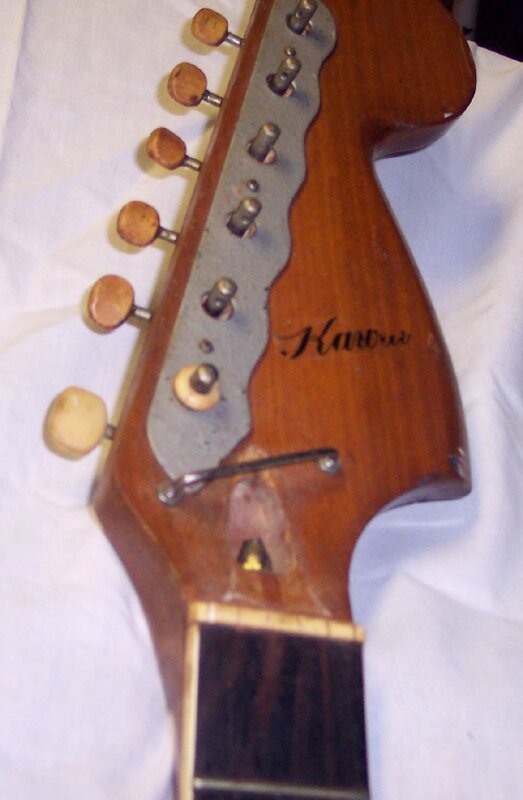 Update: See these tuners cleaned up on the refurbished guitar's page 18. A diving board could be mounted to the bridge for that swimming pool cavity! Although swimming pool routing doesn't work well with some guitar designs, ....I am sure that this cavity will afford a resonance under the aluminum pickguard mounting those nuclear pickups, ...that will greatly accentuate the cavity's / pickguard resonance and driven right into the pickups in a strong speaker field. And the lonnnnng pots routing wing will also buffer the frequency slopes of different resonances so they overlap and blend much better rather than more-narrowly announced at their resonant frequencies. The metal decor piece below the string post ferrules is factory painted silver. It should clean up reasonably well; Or if desired, an identical appearance 'Panel Silver' paint is readily available in automotive paint stores to repaint after a good / proper prep job. Again, ...the truss rod nut cover is in excellent condition, but was soaking in a sonic bath of rejuvenating oil when these pictures were recently taken. Standard non-splined tuner string-post ferrules will fit right on these tuners in place of the plastic ones. However, even plastic or nylon ferrules that fit could probably be found at a large hardware store. The appearance of a wave on the top edge of the neck binding below, ....is a digital camera quirk of pixel shift-blending. The actual binding is straight and never been refretted. only about $25 to do so. After working with this guitar again, ...Thanks to those who have inquired about it; ....I've just about convinced myself that this should be the next guitar I refurbish unless it is sold by then. It's just too much of a gig / tone monster to let sit idle; And seeing a neglected fine old guitar resurrected and turned into a real Player is a real joy. UPDATE: Well I guess this guitar just wasn't meant to remain in my stable; A Buyer has emerged; So the remaining pages of this website is the inspection and work being done buttoning this guitar up to ship to him. String spacing at the bridge is a hefty 7/16" (2.19" span). String spacing at the nut is 9/32" (1.41"span). There is enough fretboard beyond the outer nut slots, to accomondate a re-nut span of about 1.55", especially if the bridge string spacing were reduced to a more standard 3/8" range (1.88" span). 4 "nuclear" Teisco pickups; 6 Rocker Switches. Tone right down to a banshee's bones. The non-original tuner turns the opposite direction than the other 5. How's that for full-on old blues mojo ! Couldn't think that one up if ya tried. Although 6 in-line tuners are quite easy to acquire and replace; I be darn if I would spoil that mojo if these keep the strings in tune ....and I can see no reason they wouldn't if used properly (With all old cam-lock tuners, ...always tune up to a note and not tune down to a note. If you tune up past the note, drop back down below it and come back up to it).